Thule Traverse Single Bar Roof Rack Package , Truck & Car Racks from Proline: Thule Racks, Yakima Ski Racks, Bike Racks Canoe and Kayak Racks Cargo Carriers and Truck accessories. 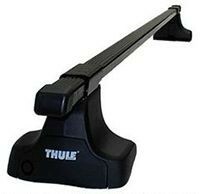 Thule Traverse Single Crossbar Roof Rack package. Mounts to tucks & cars without rain gutters.